Just a couple more days left and Tony will be choosing a winner for his Winter Cigar Giveaway! Did you enter yet? There’s lots of different ways to enter so no one is excluded. Make sure to read Tony’s Winter Giveaway and enter quickly! If you are a follower of ours on Twitter or Facebook, you will have seen recently that Tony is off slacking again. That’s right, again! lol. Ok maybe not. He’s actually on a trip to the Dominican Republic and visiting lots of people, cigar factories, and even some tobacco fields. I’m sure he’ll have lots to tell everyone when he gets back. In the meantime, keep up with what he’s doing by following him on Twitter or following the Casas Fumando Facebook Page. So I’m still stuck at home and while Tony is probably burning up in the Dominican, and I’m pretty much freezing over here. Terrible forecast for the week full of rain and near freezing temps, winter is almost here! 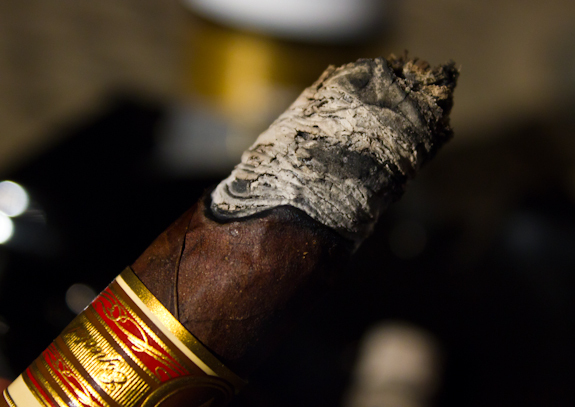 The summer flew by… So for no particular reason I made a mess in my humidor searching for my next review and what I came up with was my very last Oliva Serie V Maduro Especial from 2010. 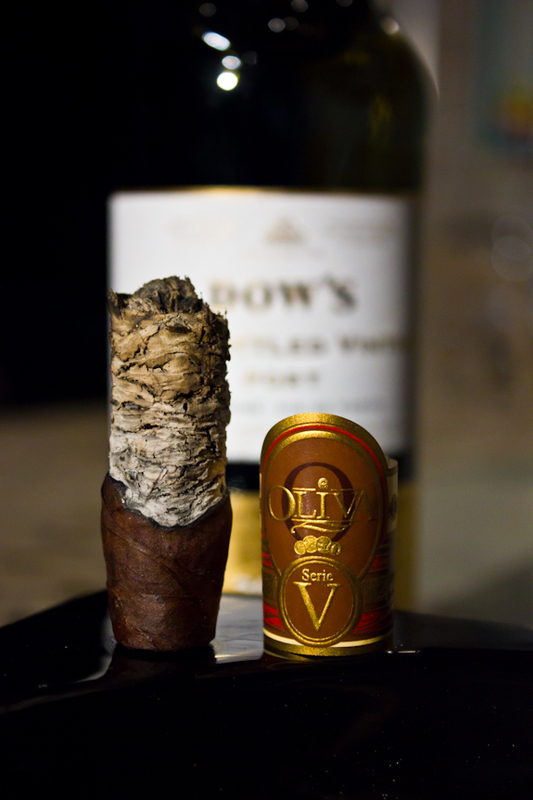 Now Oliva should be a name most people know by now, they’ve been around for a long time and have a great reputation of turning over quality cigars year after year. They haven’t been much in the past for really branching out with drastic ideas but rather have been that “staple” cigar brand that you could always fall back on. Their 4 main lines are the Serie G, Serie O, Serie V and the Connecticut Reserve. Of their 4 lines mentioned, the Serie V is the fullest on the body scale. If you have been keeping up with the cigar news, you would actually see that Oliva is starting to bring a lot more variety to their lines. They’ve had the Master Blend series for awhile now and are also hitting a few winners with the Studio Tobac project. 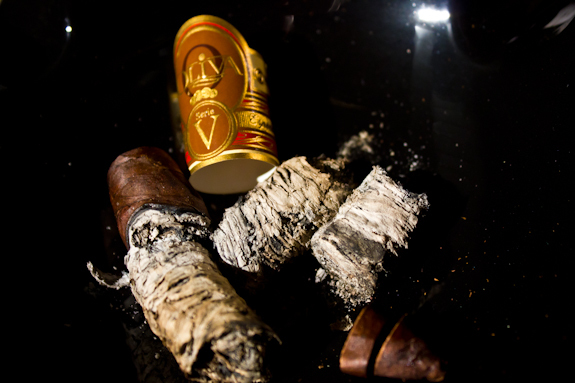 Tony actually just recently posted a review of the cigar made by a joint venture of Studio Tobac and Padilla, appropriately named the Padilla – Studio Tobac Figurado. As you can see from his thoughts, Oliva is on the right track with their new project. 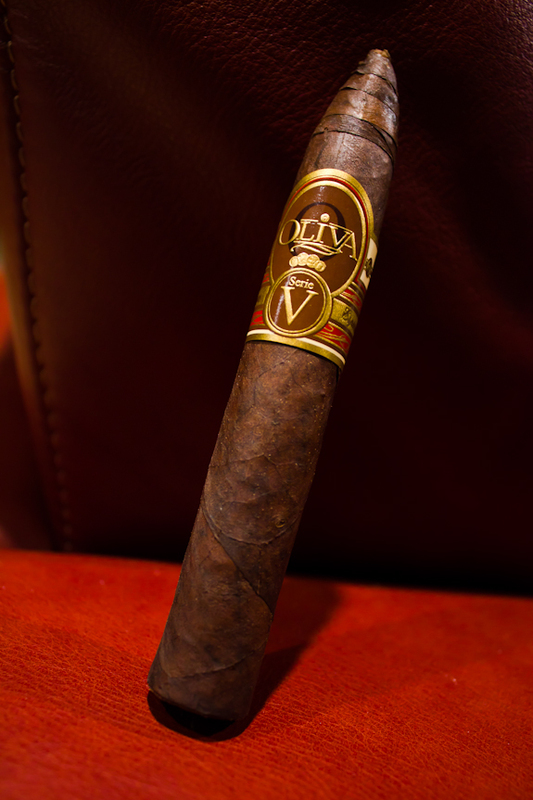 Oliva’s core lines don’t usually change much but a few years ago they decided to bring out a special edition of their Serie V. It was to be wrapped with a Maduro leaf, limited in production quantities and restricted to a single vitola. 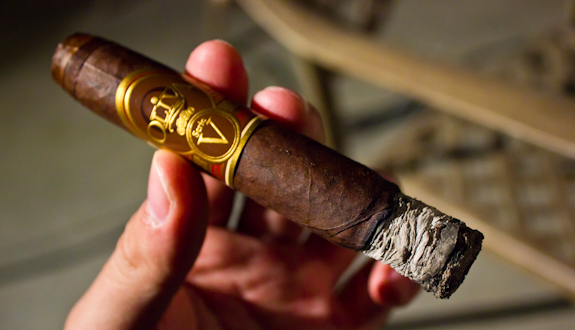 It’s full name is the Oliva Serie V Maduro Especial and usually a year is appended to that. In the case of today’s review it is the 2010 to mark the year it was released. Unfortunately, there is no easy way to distinguish some of the various years. With regards to the 2009 and 2010, you will find 2 main differences, firstly, the 2010 is a slightly larger ring gauge than the 2009 even though it maintains the same vitola. Also, the 2010 is wrapped in a nice dark San Andreas wrapper versus the previous years Broadleaf wrappers. 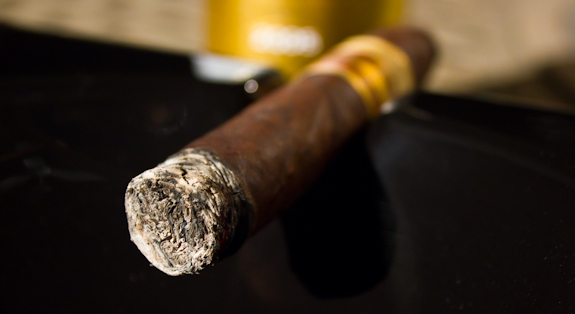 Looking a little forward to 2011, the vitola is changing to a 6×50 Toro and should actually be hitting shelves very soon. It also has the same San Andreas wrapper. The production for the 2011 is also the same as the 2010 I’m reviewing today which is 5000 boxes of 10 cigars. With a price point of $10.70/cigar they aren’t that steep but aren’t cheap either. It seems to strike a nice balance of a slightly high end or limited production stick. I’m also told that the 2011 version is dropping the MSRP to $9 which is a welcome change. 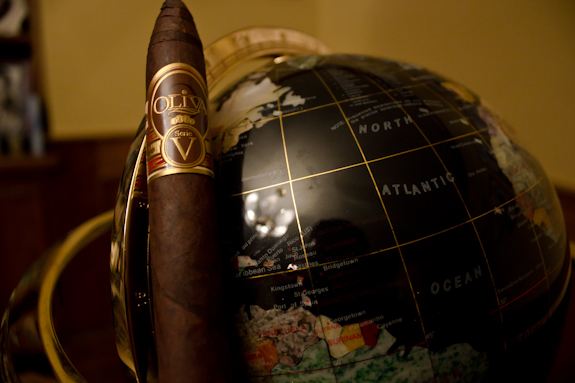 Each of the Oliva Serie V Maduro Especial cigars are packed with a Ligero longfiller from the Jalapa Valley in Nicaragua which is well known for producing tasty and quality leaves. 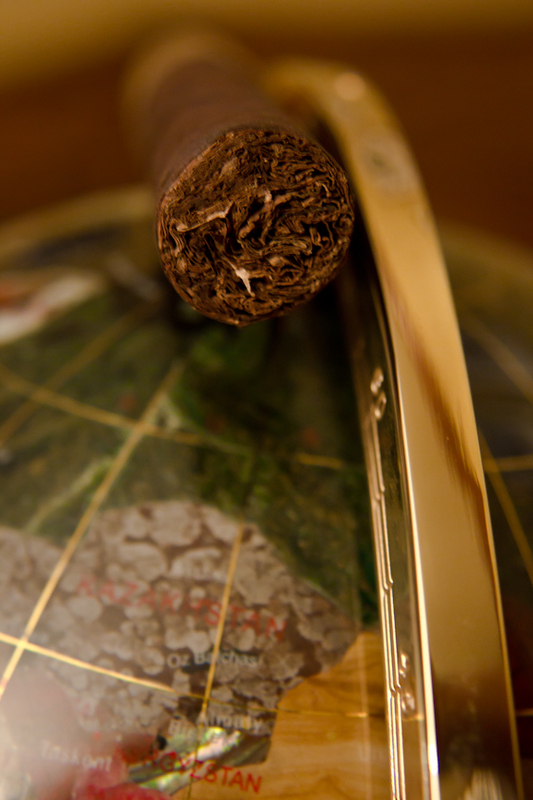 The band on this cigar is fairly unassuming and doesn’t venture far from the standard Oliva lines. It adds “Maduro” on one side and “Especial” on the other but I’m disappointed that it doesn’t include a year. Not a huge deal but it would be a nice touch. I’m sitting down to enjoy this cigar on a fairly chilly evening here. 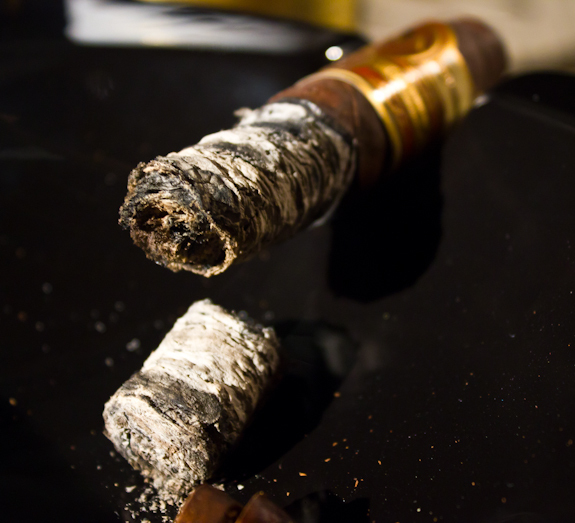 The cigar also has a fair bit of age on it so that will affect the flavors. I have smoked a few of these before so I’ll make a quick comparison to then and now in the summary. Enjoy! •	The chocolate almond flavors dwindled down a bit and I’m left with mostly coffee, spices and now some cedar. It’s still good but the start was much more enjoyable, let’s hope it returns! Overall this was a pretty good smoke that I enjoyed. I feel that it never really did recreate that initial awesome roasted almond flavor. The beginning of the cigar was great and the remainder was good. Nothing about it was really bad, my only complaint would be the burn issues. Thankfully they didn’t negatively affect the flavors but it did take away from the whole experience a bit. 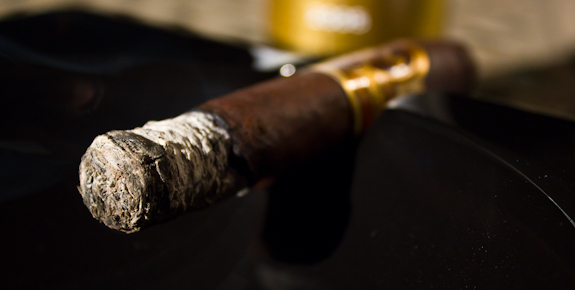 I think the cigar could have earned itself a few more points with a bit more age as it already has. The ones I smoked earlier this year were not as good as this one. So my suggestion, grab a few and let them sit a few more months and they should be excellent. If those roasted almond flavors can linger a bit longer this would have been a fantastic cigar. The little bit of body buildup at the end was a nice touch for me as well. The price is a little high at just over $10 but I’m excited to see what the upcoming 2011 release brings since it will have the same wrapper and be $1.70 cheaper! Tonight’s pairing is a new Port wine that I picked up at the liquor store the other day. It’s from Dow’s Winery which comes from the Symington Family Estates in Portugal. The 2005 Late Bottled Vintage Tawny Port has a fairly light and fruity feel on the palate with some deep notes like a touch of chocolate and woodsiness. It’s probably not the best Port I’ve had but it’s not bad in it’s own right either. 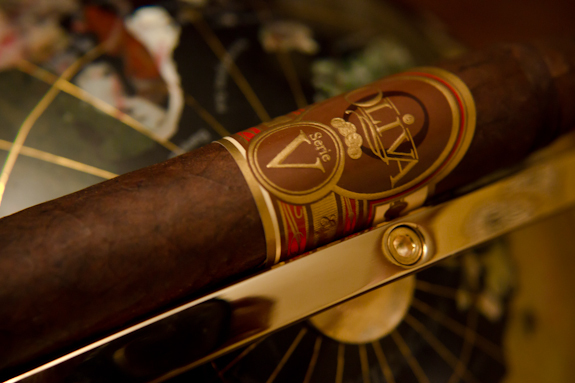 It paired excellently with the flavors of the 2010 Oliva Serie V Maduro Especial. Other than Port I think this cigar would pair wonderfully with a heft stout, a strong or chocolate flavored coffee or even a nice scotch. Hey buddy, go Flyers!!! Great pictures they seem to be gettiing sharper, that shot of the cap looked crazy!! 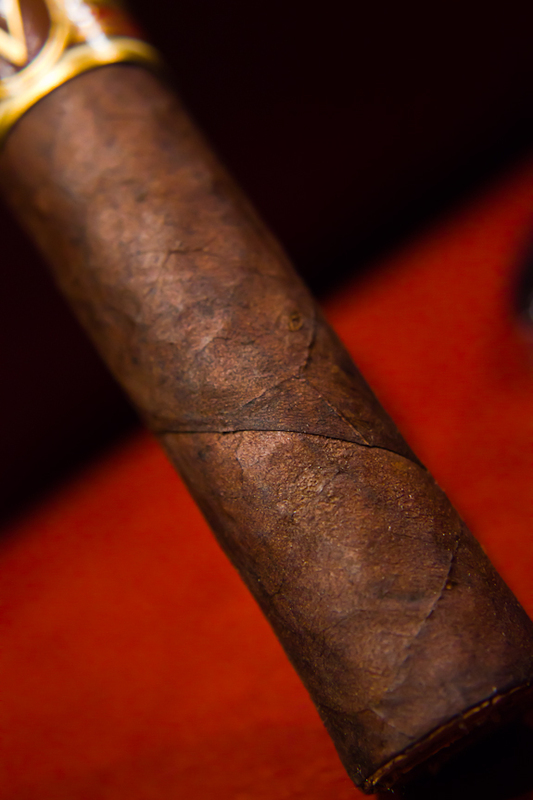 I’m a hugh Series V fan but haven’t had the pleasure of trying the Maduro, I’ll have to keep my eye out for this stick. I definitely like these Maduro’s more than the standard Serie V. The 2011’s should be in stores this week or next week so be sure to look out for them! Very informative review, Daniel. I only have one of these (from THAT sampler), so it’ll rest a while longer. Good news on the 2011 pricing. I’ve had the Dow’s Fine Tawny Port, and i hope this one is better. The Fine Tawny I found to be pretty thin for a port. Almost like they had some regular table wine mixed in. I think this Dow’s was pretty much the same, very light and definitely not one of my favorites. But you don’t know until you try I suppose! 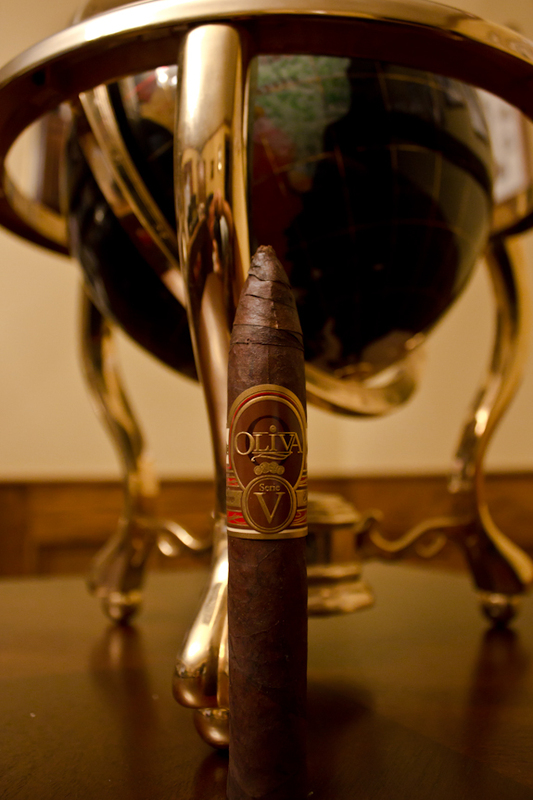 Oliva is one of those brands I never reach for…. I’m not sure why. I just always find something else to grab first. I do enjoy them when I smoke them, just never seem to haqve them on hand. Nice review. Might need to pick up a few…. Tadd, I think you need to visit Oliva a little more. They are a good consistent brand that doesn’t disappoint! 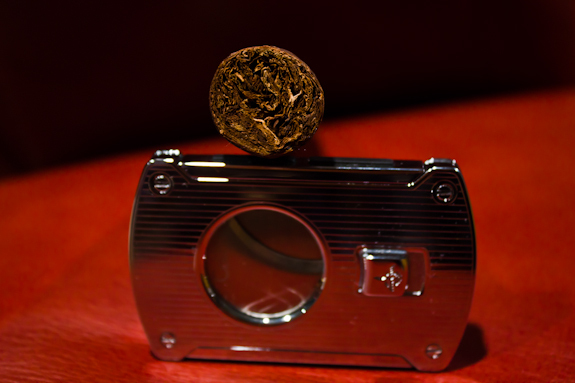 Hello Daniel, great photos, they all excellent, love the Oliva cigars, this one I think might be a little strong for me. Did enjoy the review,good job. Thanks Swede! This cigar was super smooth and didn’t feel as strong as I would have expected. 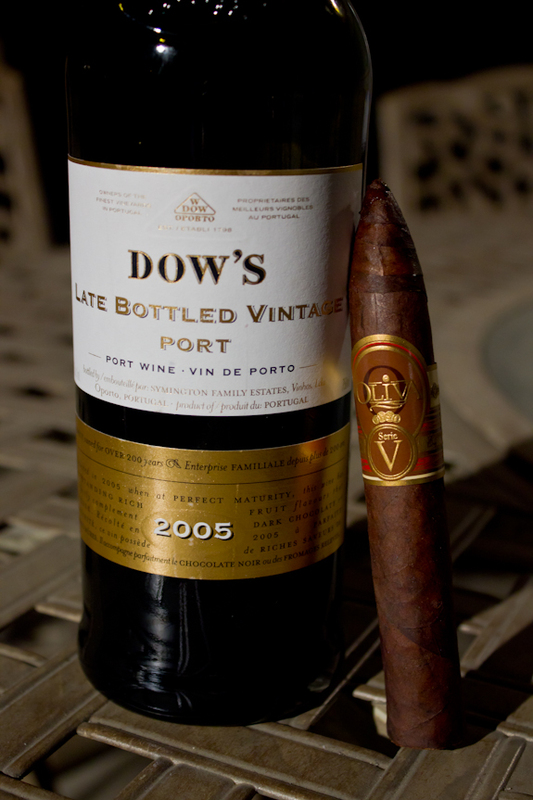 The right pairing is the key if you are worried about a cigar being too strong! Just popping in. The pictures on this review are great man! i haven’t had this blend but the previous year’s was very good. Stay cold bro. its hot, muggy, and sticky here. Heading back to the states soon! I still have the 2009s as well as an unopened box of the 2010s. I can’t wait to finally break into them. The pictures as always are awesome. One day, I can take fancy pictures with globes in the background like you guys. Ballin’! Keep up the good work. Excellent review. bwahahaha Byrdman, I be ballin’ in these pictures! 😉 You gotta let me know how age has treated those 2009’s? Daniel, I have a box of the original 2008’s with 8 sticks left. My home lounge was originally an Oliva branded lounge and the charter members got a box each for the lounge’s grand opening. Let me know if you would accept the invitation to send you one to review/sample and I will care package it up and ship it to you. I am sure that there are others, besides myself who love to know what you think. Talk about some “age” on it!!! Komodata, that is SUPER generous of you! There’s not many of the 2008′s left in the cigar world these days and I would be ecstatic to get my hands on one! I will definitely make a review of it in your honor! Komodata, nice pictures! Those 2008’s are a sight to behold! I really wish I had the patience to let my sticks age like that. I usually can’t wait more than a week to bust open a box and rarely do my boxes make it past 6 months.